Perform this Skaal ceremony by hunting the great Spirit Bear. Speak with Korst Wind-Eye in the Skaal Village and agree to perform the Ristaag. After nightfall (around 10 pm) find Rolf Long-Tooth a little ways west from the northern tip of Lake Fjalding. Speak to him to learn the details of the hunt. Wait by Rolf for a bit and investigate the disappearance of Sattir. Find his body behind some rocks just to the southwest. Follow Rolf for a bit and investigate the disappearance of Grerid when he asks. Find her body behind some rocks to the east. Follow Rolf some more and you will shortly be attacked by three werewolves. Kill them and speak with Rolf. Wander around until the Spirit Bear appears and kill it. Return with the heart of the Spirit Bear to Korst in the Skaal Village. After returning the totem, the Shaman Korst Wind-Eye will ask you to perform the Ristaag, a ritual hunt that is meant to bring favor from the All-Maker on the Skaal. You are to meet at night-fall, along with Rolf Long-Tooth, who is on the western shore of Lake Fjalding. The directions, again, are slightly deceiving, as Rolf is far west from the western shore at the very northern end of the lake (coordinates -172145, 196843, 1112; if you see a second river, you're already passed him). Around 8pm is the earliest time you can find him and the other two hunters. 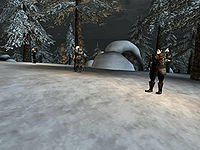 They are in a slightly elevated snowy forest area carrying torches, and Long-Tooth is in the middle. Rolf explains the ceremony which involves hunting the Spirit Bear summoned by the Totem of Claw and Fang you recovered. The bear must be slain and its heart returned to Korst before daybreak or the ceremony will not succeed. You are to follow and protect Rolf during the hunt. After this you will wait with Rolf for a short period before you hear a bone-rattling roar. Rolf will tell you that it came from Sattir the Bold's path and asks you to investigate it. Explore just to the Southwest of Rolf and you'll find Sattir dead behind some rocks (coordinates -173998, 194749, 677). Return to tell Rolf of the matter. Rolf will now take off towards the south so follow him. After a short jaunt you'll hear another scream and Rolf will ask you to check on Grerid Axe-Wife. Turn to the east and check behind some rocks to find Grerid's corpse (look for her torch light) (coordinates -167780, 193467, 233). Return to Rolf with the bad news. He will lament the loss but continue on with the hunt. Seeing as you and Rolf are the last two on the hunt, you should be on your toes. After a short time you will be suddenly attacked by three werewolves so have your weapon and healing potions ready. Speak with Rolf after the attack and he'll be so impressed that he asks you to lead the hunt for the Spirit Bear. Since Rolf has now asked you to lead the hunt, its up to you to find the Bear, although you have been given no real hints on where to find it. Continue in the direction Rolf was walking, and after a short time the Spirit Bear (which is white) should appear near you. Kill it and take the heart from its corpse. Speak with Rolf again who will tell you to return the heart to Korst alone. Return with the heart of the Spirit Bear to Korst in the Skaal Village. Korst will congratulate you on the hunt and reward you with another spell to summon a bear to your side (Call Bear). If you don't speak with Rolf Long-Tooth before you return the heart to Korst Wind-Eye, he never stops following you (until he dies). After completing this quest, you'll start seeing Horkers dying on all the northern shores of Solstheim. This is related to the next quest. Technically, they should be already dead, but the mechanics of the game do not allow for that. So instead, you'll be treated to the sound of dozens of Horkers' dying moans every time you walk near the shores. This will continue to happen every time you enter these areas from now on. It is actually possible to start this quest at the same time as The Totem of Claw and Fang, however completing this quest first prevents you from getting the Summon Wolf spell. This quest can also fail. This will happen if you do not start in time to finish it (encounter the Spirit Bear) by sunrise. If this happens, you will receive only the Summon Wolf spell. There is no opportunity to repeat this quest. The Ristaag quest can be broken if you say goodbye to Rolf before doing the "ensure our success" topic, causing him to say "Shhh… we must hunt..." with no further options. Using the Console to set the quest stage to 25 may fix the problem. After failing The Ristaag close to finishing, you may encounter the Spirit Bear, slay it, and get its journal updates even though the quest is already complete. ? 10 Having returned the Totem of Claw and Fang to Korst Wind-Eye, he explained to me that soon the Skaal will perform the Ristaag, a ritual hunt that is meant to bring favor from the All-Maker on the Skaal. 15 Because of my service to the Skaal, Wind-Eye believes it would be good for me to take part in the Ristaag. I am to meet with Rolf Long-Tooth, one of the Skaal hunters, by the western shores of Lake Fjalding after nightfall. He will then explain how the hunt will take place, and what my part in it will be. 20 Long-Tooth tells me that during the Ristaag, we will seek out the Spirit Bear that Wind-Eye has conjured using the Totem of Claw and Fang. We are to slay it and bring its heart back to the shaman. If the hunt fails, or is not completed by daybreak, it is said that bad fortunes will fall on the Skaal people. 25 I am to stay with Long-Tooth during the hunt, and to follow his instructions exactly. 30 As I followed Long-Tooth, we heard screams and unearthly howls off to our right. Long-Tooth has told me to investigate them and return to him. 40 I have found the corpse of Sattir the Bold, one of the other hunters involved with the Ristaag. I should return to Long-Tooth and let him know what has happened. 45 Long-Tooth fears that there are werewolves in the woods, and that they will try to disrupt the Ristaag. I should continue following him. 50 Again we heard screams, this time from our left side. Long-Tooth again would like me to investigate the disturbance, and return to him with my findings. 55 Grerid Axe-Wife is dead as well. I must report this to Long-Tooth. 60 Long-Tooth has decided we must continue the Ristaag. It will be up to us to find the Spirit Bear and return with its heart. 70 Long-Tooth and I were attacked by werewolves, but were able to kill them. We must now find the Spirit Bear and return its heart to Wind-Eye. 75 The Spirit Bear has been killed. I should now retrieve its heart to return to Wind-Eye. 80 I have retrieved the heart of the Spirit Bear. It must be returned to Wind-Eye. 100 Finishes quest Wind-Eye was pleased that the Ristaag was successful. He has taught me more of the Skaal magic in return for my efforts. I am now able to call a bear to aid me in times of need. 105 Finishes quest The Ristaag has failed. This page was last modified on 24 October 2018, at 06:25.